Contact Owner Jeff Feldman at 813•685-0394 for your appointment. Want to sit back and enjoy the beauty of your fish-tank while saving yourself the effort and headaches of maintaining it? 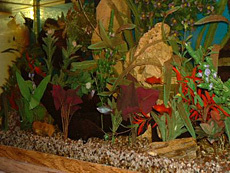 At Feldman's Aquarium Maintenance we specialize servicing all manners of systems and aquatic habitats. Allow us to take the labor out of keeping your fresh water aquarium in pristine shape and working order, so that you may simply enjoy the fruits of our expertise!